§ The 2002 inductees to the Science Fiction and Fantasy Hall of Fame were announced last weekend at ConQuesT 33 in Kansas City. Posthumous inductees are James Blish and Donald Wollheim, and living inductees are Samuel R. Delany and Michael Moorcock. The Science Fiction and Fantasy Hall of Fame was founded in 1996 by the J. Wayne and Elsie M. Gunn Center for the Study of Science Fiction (at the University of Kansas) and the Kansas City Science Fiction and Fantasy Society. The induction will take place at the University of Kansas on July 5th, as part of the same ceremony as the awarding of the John W. Campbell and Theodore Sturgeon Memorial Awards. The primary source of funds for the Hall of Fame is a benefit auction held at ConQuesT science fiction convention. § Nominees for this year's Golden Duck Awards, given for SF works written for children, include books by Eoin Colfer, David Gerrold, and Stephen Chambers. The Chicago Fantastic Film Festival is taking place next weekend at the Gateway Theater in northwest Chicago, so all the films will be shown on the big screen in an old-style movie palace. I know I've never seen The Day the Earth Stood Still on a large screen, and I'm really looking forward to it. Plus there's also that premiere of Dagon for all you Lovecraftian fiends. The movie is being released on DVD/Video three weeks after this screening. This may be your only chance to see it on the big screen. (You have to buy a full day's membership to get in though). The membership for one day is $15.00, Two-Days: $20.00 Hours Saturday: 10-6, Sunday 10-4 With After-hours events. Tickets can be bought by phone up until Thursday night at 1-800-878-9378. The art show is going to be astounding. Scott Gustafson, Basil Gogos, Gary Gianni, Douglas Klauba, Jerry Tiritilli, Randy Broecker, and Tom Gianni, and all the artists have tables to sell prints, books, posters, etc. § Finalists for the 2002 Mythopoeic Awards, given in fantasy literature and nonfiction categories, include novels by Lois McMaster Bujold, Neil Gaiman, Sarah A. Hoyt, Ursula K. Le Guin, and Tim Powers. Winners will be announced at Mythcon XXXIII in Boulder, Colorado, the weekend of July 26-29, 2002. § Ellen Datlow has posted photographs from last week's KGB Bar "standing room only" readings by Paul Park and John Crowley. § Gwyneth Jones has won the 2002 Arthur C Clarke Award, given for the best science fiction novel published last year in Britain, for Bold As Love, published by Gollancz. The Award was presented in a ceremony at the Science Museum in London on Saturday, 18 May. The prize consists of an engraved bookend and a cheque for £2002, and was presented by China Mi�ville, last year's winner. The audience included four of the other five shortlisted authors, Jon Courtenay Grimwood, Peter F. Hamilton, Paul McAuley, and Justina Robson; the fifth, Connie Willis, had a previous commitment. Award administrator Paul Kincaid described Bold As Love as "a novel which brings one of the most hallowed of all British storytelling traditions, the legend of King Arthur, into a world of twenty-first century technology, global warming and pop counter-culture. The result is what one judge called a passionate plea for imagination in politics." He also reported the judges as saying: "All the books were very good and very different, which made choosing just one winner particularly difficult, but after three very tense hours of discussion this afternoon we arrived at a decision we all agree on." Judges were Paul Billinger and Tony Cullen for the British Science Fiction Association, Doug Millard for the Science Museum, and Liz Sourbut and Lisa Tuttle for the Science Fiction Foundation. Judges for the 2003 award were also announced: Tony Cullen and Iain Emsley for the BSFA, Doug Millard for the Science Museum, and Paul McAuley and Liz Sourbut for the Foundation. The Chairman of the judges and administrator of the Award is Paul Kincaid. During the ceremony a special presentation was also made to Fred Clarke, Sir Arthur's brother, in recognition of all his tireless work over the years on behalf of both the Clarke award and British science fiction. The presentation was made by Andy Sawyer and Maureen Kincaid Speller, and consisted of an original painting by Danny Flynn. Fred Clarke, who is recovering from a recent heart attack, was present to accept the painting. The award website has posted a description and photos from the ceremony. 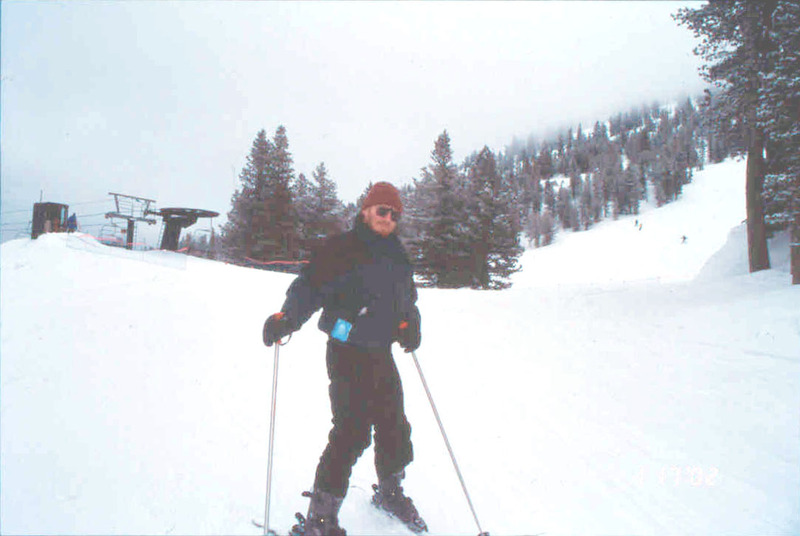 § Los Angeles fan Bruce Pelz died yesterday, Thursday May 9th. He chaired many science fiction conventions, including one World Science Fiction Convention, and was fan guest of honor at many others. Memorials are posted at http://www.lasfs.org/lasfs/bruce/.  SF/F short-story writer, costumer, and poet Betsy Curtis, 84, died April 17, 2002. She published a couple dozen stories in SF magazines from the early '50s (her story "Divine Right" appeared in the third, Summer 1950, issue of F&SF) to the early '70s. "The Steiger Effect" (Analog Oct 1968) was a Hugo nominee in 1969. A tribute to Curtis ran in Comics Buyer's Guide #1487 [not online], headlined "Thanks, Mom!". A memorial service will be held in June. The family requests that, in lieu of flowers, donations be made in the name of Betsy Curtis to The READ Program, 966-1/2 Park Ave., Meadville PA 16335. An obituary will appear in the June issue of Locus. § Screenwriter Fridrikh Gorenshtein (or Friedrich Gorenstein), co-writer with director Andrei Tarkovsky of the 1972 film Solaris (based on Stanislaw Lem's novel), died March 3, 2002, in Berlin of natural causes; Locus has no further details.  Long-time fan, collector, writer, and anthologist Forrest J Ackerman is critically ill at Kaiser Permanente Hospital in Hollywood (Sunset Blvd. at Vermont), in Building H, Room 474A, in the I.C.U. Update 12 May: In contrast to the "not expected to recover" remark from the Julie Sands letter below, Locus has received follow-up information that Ackerman, who suffered either a stroke or a heart attack, is improving and, at least mentally, doing quite well. Further developments will be posted as they become available. It was very disquieting to discover not many of Forry's friends have visited and he is very lonely. He is paralyzed except for the ability to move his head, his speech is very sparse, but he is cognizant. In fact he let me know even at his age he was able to see my cleavage very well--lol. He cannot receive flowers, but letters, visits (even by non-family members--he really has no family), phone calls and cards are appreciated.  A memorial reading to honor George Alec Effinger is scheduled for Thursday, May 16, from 7 p.m. to 9 p.m. in New Orleans, at Octavia Books, 513 Octavia Street (phone 504 899-7323). The store is just a few blocks from the Magazine Street apartment where Effinger lived before moving to Los Angeles upon his marriage to Barbara Hambly. Organizer Andy Fox, a student of Effinger's and member since 1996 of the monthly writing workshop he founded in New Orleans, has invited any of Effinger's friends and fans to read a 10-12 minute select from their favorite story or novel by the late author. § The 14th Annual Lambda Literary Awards, honoring Lesbian and Gay fiction, were announced May 2. Among the winners in over 20 categories were, in the SF/F category, Point of Dreams, by Lisa A. Barnett & Melissa Scott (Tor Books). § Nominations for the 2002 Deutscher Phantastik Preis, chosen by readers of the German website phantastik.de, have been announced. They include, in the German novel category, works by Jo Zybell, Antje Ippensen, Myra Cakan, Monika Felten, and Andreas Eschbach; in the foreign novel category, books by Eoin Colfer, Robert Charles Wilson, Arthur C. Clarke & Stephen Baxter, Connie Willis, and Stephen King. Other nominations are in categories including short story, anthology/collection, author of the year, translation, TV-series, Internet-site, and "flop of the year".  DEUTSCHER PHANTASTIK PREIS 2002: DIE NOMINIERUNGEN! 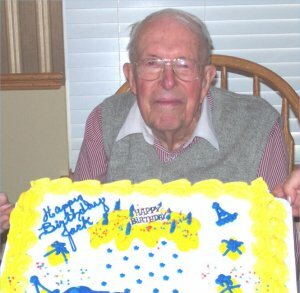 Jack Williamson recently celebrated his 94th birthday with family and friends at the home of Janet and Rick Hauptmann. The event carried even greater significant as the attendees also toasted Jack for winning his first Nebula Award. Jack was pleased with the party, and commented that "it's great to have friends." The picture shows Jack and his cake. § Ellen Datlow has posted pictures from the launch party for Emily Pohl-Weary's new book Better to Have Loved: The Life of Judith Merril, published by Between the Lines, that took place at the Bluestockings Women's Bookstore on the lower east side of New York City on May 1st, 2002 at 5 p.m. Among those attending were David G. Hartwell, Bryan Cholfin, Constance Ash, Carol Cooper, Andrew I. Porter, Gordon Van Gelder, and Kelly Link. ...King and his band of fellow writers, the Rock Bottom Remainders, were playing for the publishing crowd - the only one they can get - at Webster Hall the other night when he told resident art curator Baird Jones about his eye troubles. The disease runs in the family and the lights could go out any moment. "At least I'm alive - that's the way I feel about it," King says. § This article in The Guardian says that the Harry Potter effect -- that sales of J.K. Rowling's books spurred sales of other YA books -- was an illusion. § And this article about people who steal books from bookstores quotes Maxim Jakuboski, owner of London's Murder One. § John Middleton Murry, Jr., who wrote science fiction as Richard Cowper, died April 29, 2002, according to John Clute's obituary in The Independent. After four early, "literary" novels published as by Colin Murry, he began publishing SF with Breakthrough (1967). His best-known novels were The Twilight of Briareus (1974) and the trilogy consisting of The Road to Corlay (1978), A Dream of Kinship (1981), and A Tapestry of Time (1982). He was a regular contributor to The Magazine of Fantasy and Science Fiction from the mid-1970s through the mid-1980s (when Murry retired from writing), with stories frequently nominated for awards: "The Custodians" (1975, Hugo and Nebula nominee), "Piper at the Gates of Dawn" (1976, Hugo, Nebula, British Fantasy, and Ditmar nominee), "The Web of the Magi" (1980, British SF nominee, Balrog winner), and others. A full obituary will appear in the June issue of Locus Magazine.